Solar generators are devices that convert the sun’s heat energy to electrical energy. What is the need to turn to solar energy? Our world is edging towards an energy crisis with the non renewable energy resources fast depleting. As an alternate source of energy, solar energy stands first in the list. Solar energy panels are used world over as a green solution in several commercial establishments; but to use it at homes is still not financially feasible. But people are awakening to the use of solar energy because in the long run it reduces your utility bills, is an environment friendly resource, doesn’t produce toxic fumes or unbearable noise and most importantly as an emergency resource during power outages. The Goal Zero range of products is aimed at bringing about a change at the very basic level. As a result their products and their solar generator kits are more suited for recharging your electronic gadgets especially when you are off grid. The solar power – You can charge this generator by using any wattage boulder panel or nomad panel. With a boulder 30 solar panel the Yeti 150 takes around 11-12 hours to charge completely. A wall plug – Just by plugging the AC adapter in the solar generator kit to a wall socket you can charge the Yeti in 6 hours. The car battery – In case you are not near a wall socket and the sun is not shining, you can still charge your Yeti 150 by plugging it to the 12V port of your car. Within 8 hours your generator will be fully charged and ready to use. Stylish design: Looks always make a difference, be it in people or in gadgets. The Yeti 150 is stylish to look at and is also sleek and compact. Inexpensive: Though most of the solar generators are expensive, this little Goal Zero Yeti 150 is low in price but not in performance. Can charge multiple devices: Laptop, Smartphone, MP3 player , digital cameras, E- readers ,goal zero lights, display monitors and several other electronic gadgets that require only 2 Amp power can be charged either at the same time or one after other several times from a Goal Zero Yeti 150. Compatible with various solar panels – You can use either a Nomad 20 or any of the Boulder panels of varying wattage with the Yeti. It is really flexible in this matter and its performance is not hindered, though the time taken to recharge depends on the power of the solar panel– higher wattage charges faster while a lower panel takes one to two days. Lightweight – On your camping trails you wouldn’t want to be burdened with more weight than necessary. At just around 5 kg and like the Goal Zero Yeti 150 is a perfect companion. Solar generator portable: A comfortable user friendly handle and the stackable shape make the yeti 150 easily portable. Gas free portable power: You are not dependent on gas to refuel your generator anymore when you use the Goal Zero Yeti 150. Environmental Friendly: With the Yeti 150 you do not contribute to the noise pollution or air pollution like the normal diesel generators do. Emergency aid: Calamities like hurricanes and floods can lead to power outages and you need to be prepared. 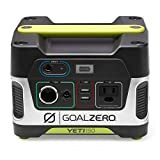 This Goal Zero Yeti 150 is a perfect emergency accessory because it is capable of charging all the essential communication gadgets like phones and laptops, so you can communicate with the authorities in case you are stuck in a spot. There are a few drawbacks to this remarkable solar generator for homes, but then like in every product these cons too can be overcome. Longer recharging time: The solar panels take longer time to recharge. Charging is intermittent: During overcast days and intermittent sunlight the yeti doesn’t get fully charged. Certain essentials can’t be charged: The Goal Zero Yeti 150 is not meant for charging your digital clocks with radios or power tools with variable speed and fluorescent lights. Thus we see that the drawbacks are not insurmountable and not hindering the overall performance of the solar generator portable. Let’s try to understand what makes the Goal Zero 22004 Yeti 150 Solar Generator a more advantageous purchase when compared to other portable solar generators in the market. Stackable: The Goal Zero Yeti 150 is stackable, small yet powerful solar generator which can be easily and unobtrusively stacked with other gear in your car or in your home. Handle: The bright green handle is soft on the hands and makes it easy to carry the generator everywhere you go. Lightweight: At just around 5 kg it definitely gives a run for their money to its nearest rivals, some of which have the additional weight of built in solar panels. Battery: The lead acid battery with a great shelf life makes it much desirable. In addition to that Yeti is safe to be carried on flights unlike the other lithium ion battery powered generators. Charges more number of times: You can charge your electronic gadgets several times more with the yeti than with the other portable generators. Unbeatable price: Normally solar generator kits are expensive and bulky. The Goal Zero is neither. It is surprisingly affordable and conveniently compact. 3 way charging: While the other solar generators are solely dependent on the sun, the Yeti 150 can be charged from the wall socket and the car battery too making it the best solar generators for homes and camps. LED display: A perfect way to keep track of the remaining charge in the generator and plan on which device to charge and which is not a priority. No need to put off joining your friends on all their adventures and trekking trips because now you have the adept Goal Zero Yeti 150 solar generator with you. If you haven’t yet purchased it then you should right away because it is the best solar generator you will find for the price. And it’s not just the price that has customers raving about it; it is its performance, weight and charging capacity. The Goal Zero Yeti 150 has it all for your camping trips. You can charge you’re your DSLRs Smartphones, laptops and also use the power to light up some camp lanterns either all at once or one by one. This immensely capable solar generator also leaves no carbon footprint because it is not bound by the fast depleting petroleum or diesel fuel. It is a smoke free, noise free way of lighting up the night when you are camping. And if you want to trek then there are goal zero kits too that are light enough to be carried along with your trekking gear while keeping the Goal Zero Yeti 150 in your base camp. Hence, we can safely conclude that the Goal Zero Yeti 150 is suited for the adventurists who love their gadgets as much as nature, the perfectionist who likes to be prepared for the power outages or the occasional malfunction of a grid and the environmentalist who is keen on leaving the earth a better place then what he/she inherited.